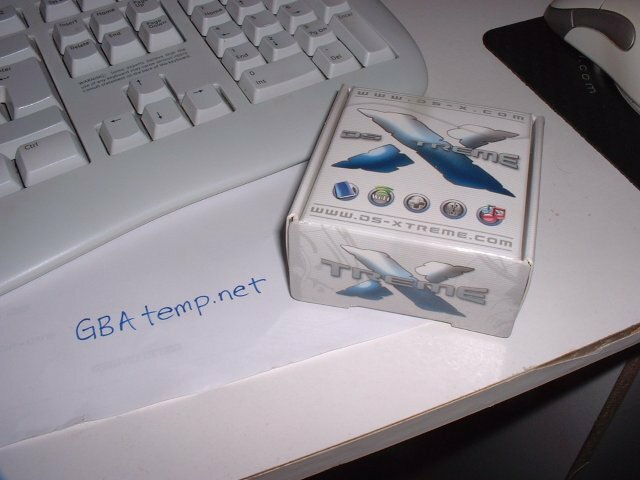 DS-Xtreme 4 Gbit in hand! Discussion in 'GBAtemp & Scene News' started by Costello, Oct 16, 2006. 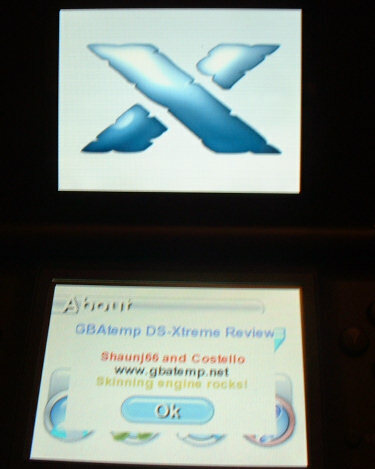 We are reviewing the DS-Xtreme! Review should be available today! We are happy to announce that we have received our DS-Xtreme 4 Gbit (512 megabyte) unit today! We are currently in the process of writing the review of it. The review should be available later today. So far, we can tell you that we are extremely impressed! At the moment all we've tried works flawlessly, all the features announced work and there's even more to discover (extended skinning capabilities, superfast transfer speed, single card multiplayer working great to any DS...) ! Feel free to ask any question in this topic and make sure you read our review this evening! Edit: the DS-X team have allowed us to host a skin file for you to toy with it and look at the possibilities of the skinning system. You can download the skin file here. Edit 2: look at the pic below! Doing this was as easy as opening the notepad and typing some text! Also take a look at that video, made by a member of the DS-X team using the DS-X skinning engine! I'm getting interested in buying one just on the strength of your report so far! damn i want to see the revieuw and buy one !! YEAH!! AshuraZro Belongs in a museum. Anyways while I'm not that likely to purchase this cart at any time in the future I still wouldn't mind at least reading the review so I'll be sure to do that later today. Is it truly 4 GB of space on that cart or is it like the EZFlash carts where 1GB = something smaller? It's 4Gb (Gigabit). That's 512MB (Megabytes). And anybody that feels they need more than that are tools as far as I care. 512MB is enough to hold 8+ games in most cases still. Yeah sorry about that, I'll make it clear in the first post. Can we use the ds-X also like a passkey to acces NDS roms on a GBAflash card in the slot 2 ? That's cause 4GB (GigaBYTEs) isn't 512MB (MegaBYTES). 4Gb (GigaBITs), however, equals 512 MB (MegaBYTEs). i heard that you can use clean dump rom on this sweet gadget. are you able to play online without having to flash ur ds ? I hope this cart has no slowdowns or longer loading times at all. Something like loading areas in Mario & Luigi. I know you all will test just the usual games like Castlevania, Metroid etc. but Mario & Luigi will be my personal speed test. yes, drag&drom of clean dump roms from windows do work fine. Online gaming works fine aswell. So far the only concern we have is that SnezziDS and SNemulDS (the two SNES emulators) do not function. They both freeze on startup (SnemulDS keeps repeating a message "Initalizing FS..." and SnezziDS shows white screens). QUOTEI hope this cart has no slowdowns or longer loading times at all. Games boot up instantly and there is absolutely no slowdown even in the Castlevania intro movie! What about talkie-games in ScummVM DS, do they work? And where is the best place to buy one? Costello it's really nice that you're providing these "on the fly" information updates. That said if it is detracting from your reviewing speed, STFU and get the pen to tha MF paper!!! I don't know why I'm getting so worked up over this cart. Oh, yes I do it's all these amazing things you keep going on about it doing! Question Dead Or Alive Xtreme 3 : Scarlet Complete Save Data? Backward Compatibility - Offline Update?